1,019 pages of FBI files and U.S. District Court for the Dallas Division of the Northern District of Texas documents covering Bonnie Parker, Clyde Barrow, and the Barrow Gang, plus bonus material. 948 pages of FBI files covering Bonnie Parker, Clyde Barrow, and the Barrow Gang. These files, once thought to be lost, were discovered and eventually declassified and released by the FBI in May 2009. Previously only three pages of FBI files on Bonnie & Clyde were known to remain in the custody of the FBI. These "lost" files were released in their entirety, without redactions. The files contain details about the Barrow Gang's crime spree not previously published before the discovery of these files. These files describe the Bureau's involvement in the pursuit of Bonnie and Clyde, which began almost exactly a year before their deaths. In late 2006, a FBI historian working out the Dallas Field Office recovered these files. They had been thrown in the trash many years earlier to make space for new files. At that time, a FBI employee retrieved the files from the trash. The FBI historian discovered their existence while preparing a historical exhibit in Dallas. The files then entered the review process for declassification. When Bonnie met Clyde in January, 1930, she was 19 and married to an imprisoned burglar, who she married when she was 15. Clyde was arrested a few days after they met for burglary. He escaped jail in Waco, Texas using a gun Bonnie smuggled to him. Clyde was recaptured, and was sent back to prison. Clyde was paroled in February, 1932. He soon returned to a life of crime, apparently murdering an Oklahoma sheriff and a storekeeper. By August, Bonnie and Clyde were together for good and making news, as they were pursued across Texas, Oklahoma, Missouri, Louisiana, Arkansas, Kansas, Iowa, and Illinois. At the core of the Barrow Gang were Bonnie and Clyde. At different times the group included others such as Clyde's older brother Marvin "Buck" Barrow and his wife Blanche, William Daniel Jones, Raymond Hamilton, Henry Methvin, Joe Palmer, Mary O'Dare, and others. Before dawn on May 23, 1934, a posse composed of police officers from Louisiana and Texas, including Texas Ranger Frank Hamer, concealed themselves in bushes along the highway near Sailes, Louisiana. In the early daylight, Bonnie and Clyde appeared in an automobile. They slowed down when they came across Henry Methvin's father Ivy standing beside his truck as if it was broken down. It was a trap. Ivy ducked away, and the officers opened fire. Bonnie and Clyde were killed instantly. John Bucher, Hillsboro, Texas: April 30, 1932 - On April 27, Bucher opened his Hillsboro store after it was closed for two men who claimed they needed guitar strings for a musical performance. He was fatally shot while making change. Eugene C. Moore, Atoka, Oklahoma: August 5, 1932 - Undersheriff Moore and Sheriff Charles Maxwell were investigating a disturbance at an outdoor dance near the rural Oklahoma community of Stringtown, when they encountered two men suspiciously milling about parked cars. Undersheriff Moore was killed instantly, while Sheriff Maxwell was seriously wounded. Howard Hall, Sherman, Texas: October 11, 1932 - Hall, a butcher at a small Sherman grocery, attempted to thwart a robbery of the store by Clyde Barrow. Doyle Johnson, Temple, Texas: December 26, 1932 - Johnson attempted to stop the theft of his wife's new car and was shot. Malcolm Davis, Dallas, Texas: January 6, 1933 - Tarrant County Deputy Sheriff Davis was among several law officers caught in a gunfight with Barrow Gang members during a West Dallas stakeout of Raymond Hamilton's sister's house. Harry McGinnis, Joplin, Missouri: April 13, 1933 - Detective McGinnis received multiple gunshot wounds as he and other officers approached a Joplin, Missouri home used as a hideout by the Barrow Gang. John Wes Harryman, Joplin, Missouri: April 13, 1933 - Constable Harryman was also shot at the Joplin hideout. 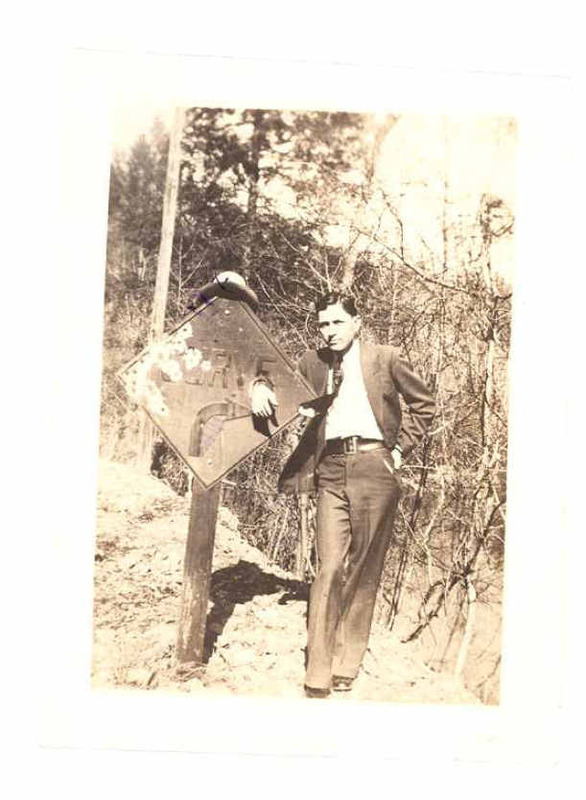 Henry D. Humphrey, Alma, Arkansas: June 26, 1933 - City Marshal Humphrey was shot and killed at a roadblock north of Alma while attempting to stop a car carrying members of the Barrow Gang. Major Crowson, Huntsville, Texas: January 16, 1934 - Crowson, a guard at the Eastham State Farm was shot and killed during the Barrow Gang raid to free inmates at the prison. E.B. Wheeler, Grapevine, Texas: April 1, 1934 - Texas Highway Patrolman Wheeler was killed on Easter morning when he approached a Barrow Gang car stopped on the side of the road. H.D. Murphy, Grapevine, Texas: April 1, 1934 - Texas Highway Patrolman Murphy was Wheeler's partner; he was also killed at Grapevine. Calvin Campbell, Commerce, Oklahoma: April 6, 1934 - Constable Calvin was shot and killed while approaching a Barrow Gang car stuck in a muddy road. Calvin's partner was taken hostage. Campbell, a 61-year-old single father of eight, is believed to be the last Barrow Gang victim to be killed. The 945 pages of FBI files date mostly from May 5, 1933 to February 1, 1935. The files show on how many different levels law enforcement worked together closely in the hunt for the Barrow Gang. The files show the sharing of information, leads, and informants, with the FBI often acting as a clearinghouse for the spread of information across the Midwest. New Orleans Division Special Agent Lester Kindell, for example, played a central role in this cooperative effort to track the fugitives in Louisiana and parts of Texas, joining hands with former Texas Ranger Frank Hamer and other local law enforcement agencies. Kindell was also closely involved in discussions that led to the final confrontation with Bonnie and Clyde, although he did not participate in the fatal ambush. Within the collection each file section is named as the original file was named and includes all pages that were in that file, in the arrangement released by the FBI. Memos detailing the investigation of two stolen cars, which lead to FBI getting involved in the case. A bureau report on the April 13, 1933 Joplin Missouri police shoot-out. Reports of information obtained from informants days before Parker and Barrow were killed. Reports tell of the extent of the injuries Bonnie sustained during the gang's run. Several handwritten letter pages from Texas Ranger Frank Hamer on The New Inn Shreveport, Louisiana hotel stationary. 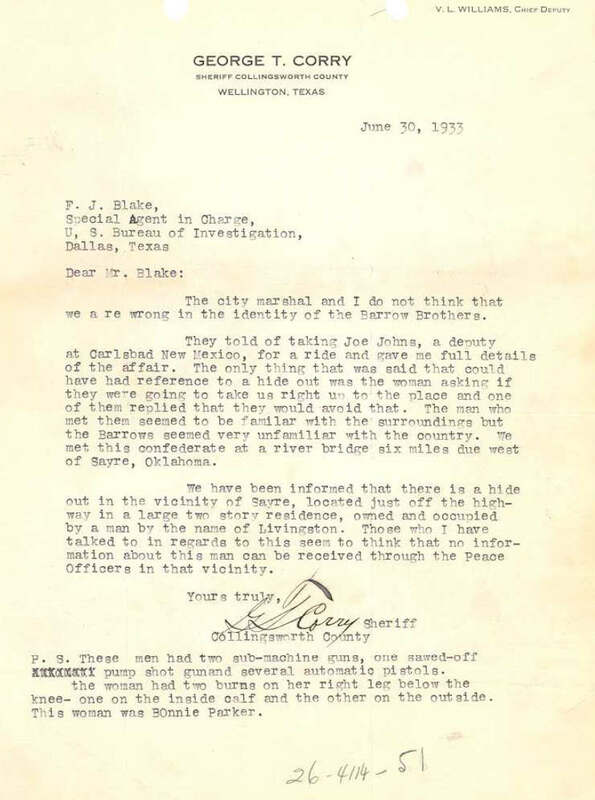 A June 30, 1933 letter from George T. Corry, sheriff of Collingsworth, Texas to the Bureau concerning his being taken on a ride, kidnapped, by the Barrow Gang. 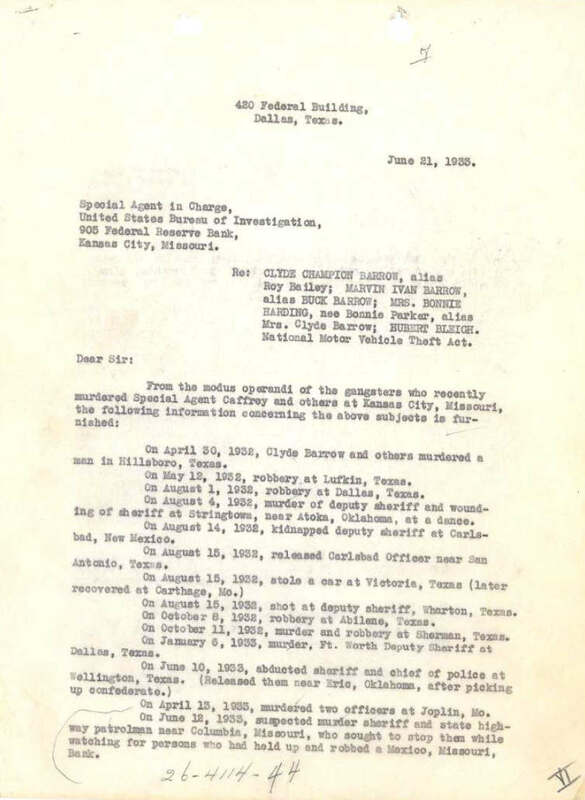 A July 8, 1933 report with 8 pages of detailed information of the gang's kidnapping of George T. Corry, sheriff of Collingsworth, Texas and Wellington, Texas Chief of Police Paul Hardy. A July 10, 1933 memo gives an account of the appearance at the Bureau's Dallas office of the brother of Constable J. W. Harryman, who was killed at the Joplin shootout by Barrow Brothers, who stated his intention to kill the Barrow Brothers. An August 17, 1933, 26-page report on the gang's activity from July 20, 1933 to July 27, 1933. 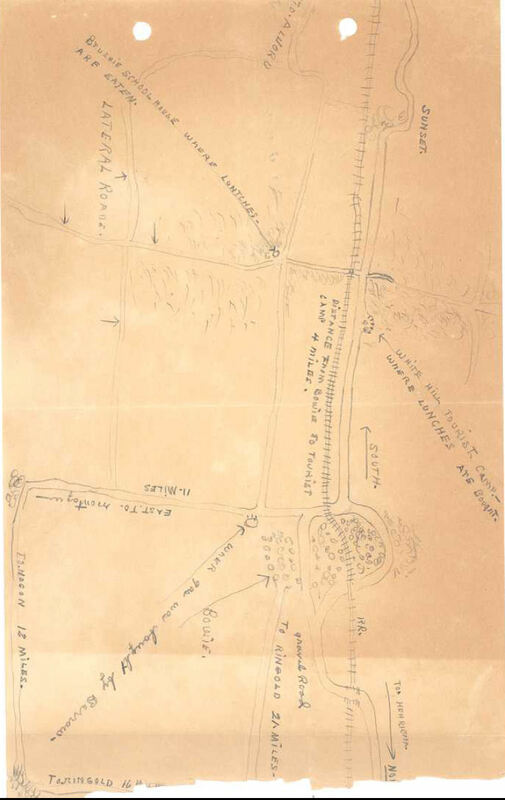 The report summarizes the various leads and witness interviews during this stretch of the hunt for the Barrow Gang. The report contains a death bed interview of Marvin "Buck" Barrow. Buck received wounds to the head during the Platte City shootout. He received additional wounds in the back during a shootout in an open field near Dexter, Iowa. He died at Kings Daughters Hospital in Perry, Iowa on July 29, 1933. The agent who interviewed Buck described him as being cynical. Although near death, the report says that he would laugh heartily on the retelling of his escapades. The report also gives the results of a jail house interview with Buck's widow, Blanche Barrow. Later in the report is the transcript of the 5-page confession Blanche gave on August 16, 1933. 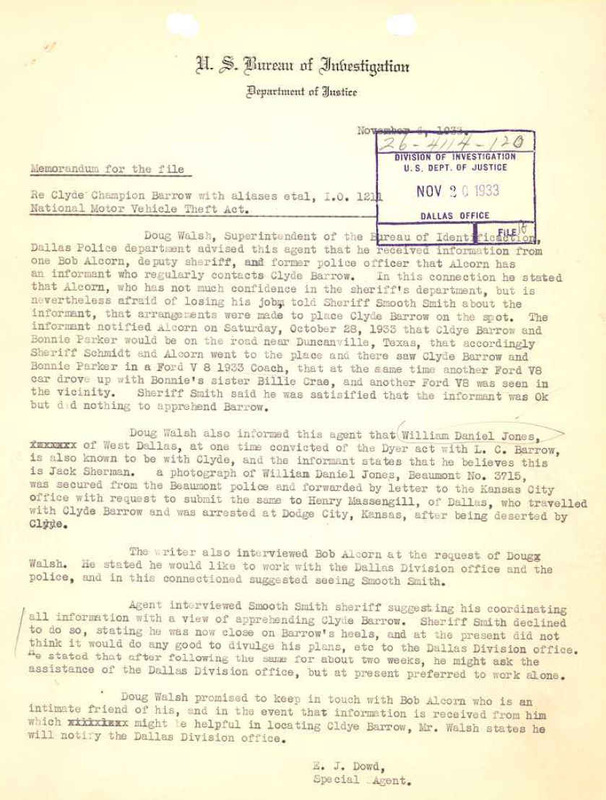 A November 20, 1933 report covers the informant information that lead to the failed "Sowers Ambush." Dallas County authorities learned that Barrow and Parker would be attempting to meet up with family members near Sowers, Texas. Waiting for them were Sheriff "Smoot" Schmidt, Ted Hinton, Ed Caster and Bob Alcorn. When they spotted Bonnie and Clyde in a black 1933 Ford V8 coupe they opened fire. Although wounded, Bonnie and Clyde were able to escape and steal another car at gunpoint. A December 23, 1933 report conveying information from a nurse friend of Bonnie, Hattie Crawford, who says she treated Clyde's gunshot wounds. A 5-page, December 14, 1933 memo recounts the information given in an interview by captured Barrow Gang member William Daniel Jones. A January 5, 1934 report indicating a willingness on the part of Bonnie's brother, Hubert "Buster" Parker, to give up Clyde if it meant saving Bonnie. Memos, telegrams, and handwritten reports from mid-January 1934 chronicle the Barrow Gang going to the Texas State Prison system's Eastham State Farm and launching a raid freeing Raymond Hamilton (Floyd Hamilton's brother), Joe Palmer, Henry Methvin, and Hilton Bybee. During the escape one guard was killed and another wounded. A January 17, 1934 Bureau report written at Eastham State Farm concerning information gain from interviews at the prison. A March 29, 1934 report gives details of gang's actions after the Eastham State Farm Prison breakout, with information provided by a recaptured Hilton Bybee. An April 21, 1934 memo following information concerning Clyde Barrow's attempts to contact a former girlfriend. An April 24, 1934 memo shows that Bailey Tynes, Clyde Barrow's cousin, was paid $4.00 a day as a bureau informant. 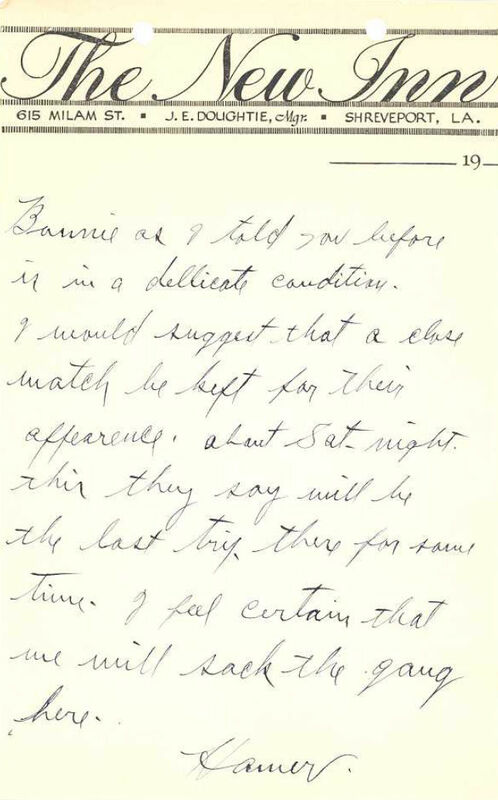 An April 24, 1934 memo to J. Edgar Hoover tells of the immunity deal that Texas authorities made with Methvin family "provided the Methvins would place Barrow and Bonnie Parker on the spot." A May 3, 1934 Bureau report contains a 5-page transcript of a signed statement by a captured James Mullen, giving an account of the Gang's situation since the Eastham prison breakout. From May 3 to May 22, 1934 a variety of typed and handwritten memos, letters, and telegrams indicate a tighter, ceaseless, and destined hunt for Bonnie and Clyde. 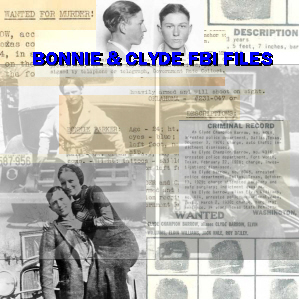 These three pages titled, "Clyde Champion Barrow, with aliases, and Bonnie Parker, with aliases, National Motor Vehicle Theft Act, Interesting Case Memorandum," were once the only Bonnie & Clyde FBI files known to exist within the Bureau. They were produced in 1934 and revised in 1984. This three page memo was intended to provide a clear summary of their backgrounds, crimes, and law enforcement's hunt to bring them to justice. It was meant to be used as background for interested journalists, researchers, and FBI employees. This 260 page booked was published in 1934, full title: Fugitives The Story 0f Clyde Barrow and Bonnie Parker as Told by Bonnie's Mother (Mrs. Emma Parker) and Clyde's Sister (Nell Barrow Cowan)Compiled, Arranged, and Edited by Jan I. Fortune. This book was published just three months after the deaths of Barrow and Parker. While probably not holding up to journalistic standards of today, it is still two interesting family stories from both the Barrow and Parker family. Reference is made to the contents of letters and diary entries. National Parks Service 39-page report on the granting into the National Register of Historic Places of the Bonnie and Clyde Joplin hideout. The Joplin hideout was designated a national historic place on May 15, 2009. The report includes detailed information about the location and physical aspects of this garage apartment at 3347 1/2 Oak Ridge Drive. It includes a well researched 14-page history of the Joplin Shootout. The report includes 8 photos of the apartment taken in February 2009.